creative savv: When you have (and love) a thing long enough . . . When you have (and love) a thing long enough . . .
. . . something about it eventually gives out. This is my favorite jacket to wear around the house, most of the year. It's fleece, so it really holds in the warmth. I've had it (and worn it almost daily) since 2004. Some might say I should just toss it and buy a new jacket. But for me, it's just "perfect". Do you know how hard it is to find another "perfect" jacket? The zipper pull attachment thingie came off a couple of years ago. No problem, I can still grasp the remaining part of the zipper pull, to get it zipped up snug as a bug. But a couple of weeks ago, I noticed that the teeth on the plastic coil zipper had come off of the fabric zipper tape. Bummer!! Never had this happen before. So I had no clue what to do to fix this one. This isn't a "fix" often listed on sites like ehow. 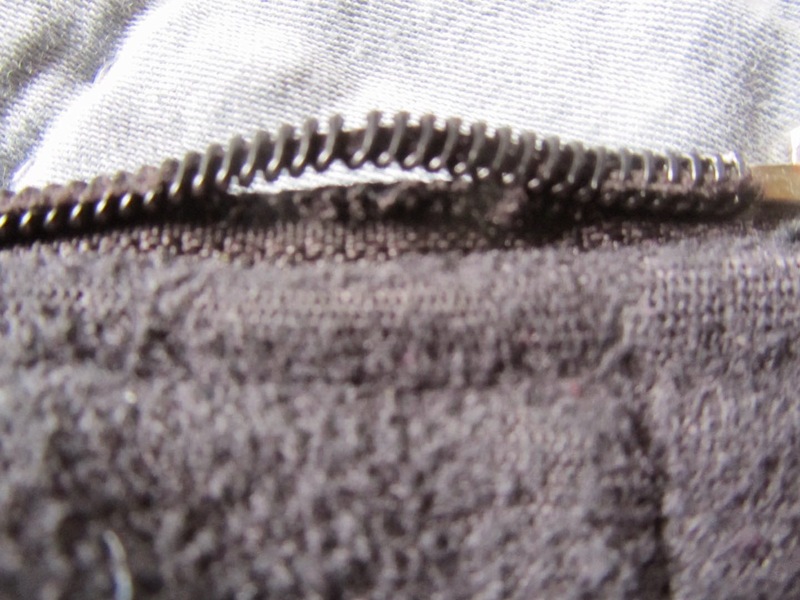 The usual zipper breakdowns are things like separating zipper teeth and missing pulls. So I had to research the various zipper types, how they're made, and then half-guess what to do to fix my little zipping problem. Upon extremely close inspection, in the bright light next to a window, it appeared that the stitching had come undone in this 1-inch spot on the zipper coil/tape. I could see some small threads on the backside of the zipper. So I got out a needle and black thread and carefully stitched the zipper coil back onto the tape, making sure to catch the zipper coil each time that I came up from the underside. Anyways, my fave-of-all-time jacket is back in service! A new zipper isn't that difficult to put on that jacket! Also, if you go to a dry cleaners or a shoe repair shop they can easily put on a new zipper pull! Or put on a large paper clip and that will be your new "pull". I'm no professional but I have put in new zippers and it really is very easy. Enjoy the jacket again for a while! The little piece where something like a paper clip could fit through broke off about a year ago. I suppose I could scavenge a zipper pull off of something no longer being worn, to put on this jacket. You're right, a new zipper could be added. When the zipper becomes unfixable, then I'll consider doing that. For now, this was probably the quickest of all fixes, just reattaching the coil. Doing zippers (and buttonholes) has always intimidated me. I can do them, but it's my least favorite thing about sewing. I appreciated your comments. Do you have any pointers on putting a new zipper onto an existing garment? Congratulations on saving your old favorite for a while longer! It was fortuitous that your favorite did have a nylon coil zipper. As you've seen, the repair on that really isn't hard, thankfully! You were right that some zippers ARE individual pieces clamped on (look closely at a metal jean zipper or the newer plastic-y big-toothed show zippers on outdoor gear); and if you pull off a tooth of one of those, you're going to need to just replace it. Like Alice, I've replaced quite a few zippers and though I originally hated (and was intimidated by) doing them, I don't find them difficult, generally speaking, now that I have some experience. My best tips are to 1) carefully examine how the zipper is attached before you remove it. 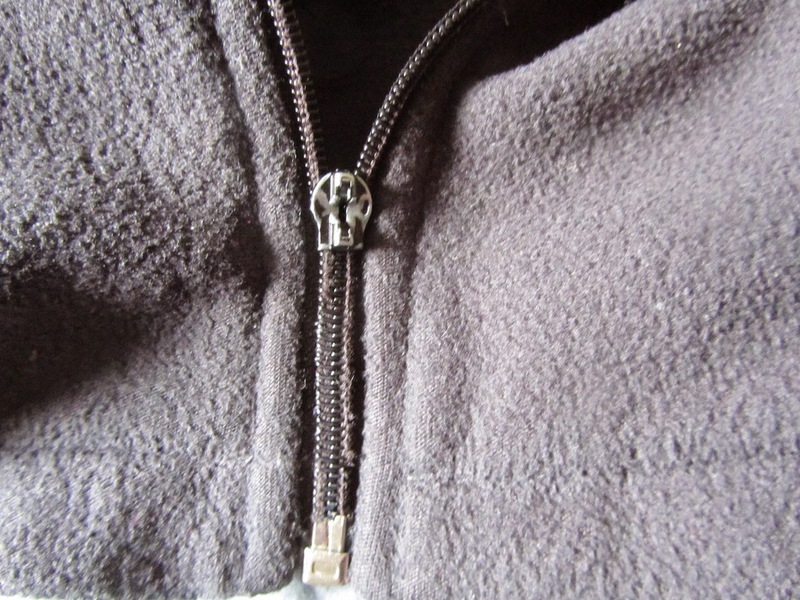 It's not as big a deal for a fleece jacket, but for slacks or a skirt or a dress, you want your new zipper to be in pretty much exactly the same place, both so you don't have unwanted extra stitch holes/lines, and so it fits like it did before. A lot of times the trick to this will be that seams have been trimmed and/or topstitched after the zipper was sewn in-- leaving you without the seam allowances you'd prefer to have. And 2) check if you have a zipper foot (or can find one to buy) for your machine, if you don't already know. (Or on some machines, you can change the needle position to accomplish the same effect, I think.) Being able to keep the presser foot firmly on the zipper tape, but right up next to the coils makes all the difference in the world for neatness and accuracy. Also remember that the beauty of a zipper is that you can zip it up or down as you sew, if you can sneak it under/past the presser foot. :) So, say you're doing a skirt zipper that's lapped, not centered. 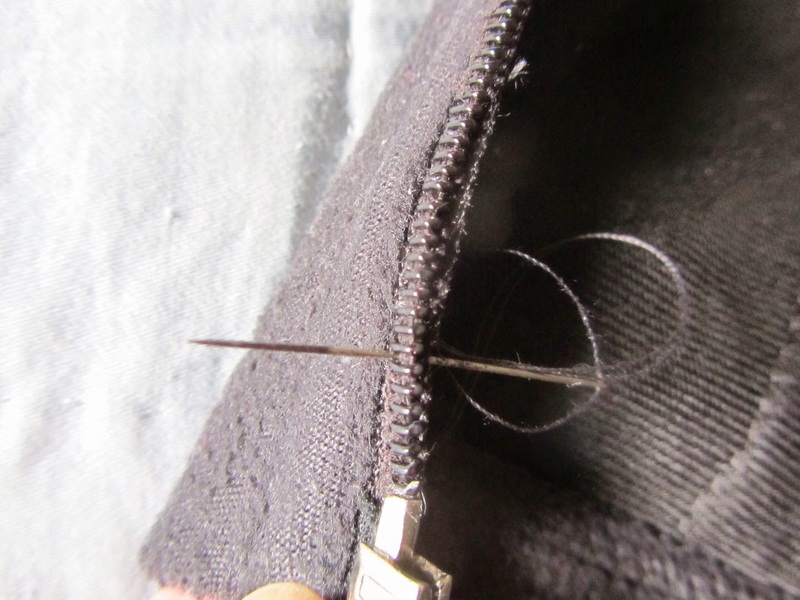 You might want to start with the zipper open, to get really close against the coil on the close/covered "under" side. Then you might want to zip it up while you do the topstitch of the "wide" side, until you get close to the top, and might want to zip it back down out of the way to get a smooth stitchline right up at the waistband. Thank you for the tips on doing zippers. You know, I've always sewn a lot, but those pesky zippers get to me. I sewed my own wedding gown, and decided to sew the zipper in by hand. I made teeny-tiny stitches, so you can't even tell there's a zipper there. But I should tackle zipper replacement at some point and just be done with it. Unfortunately, I do have a zipper needing replacement. It's on one of my daughters' old backpacks. She has a great backpack for university, now. But her high school backpack would be nice for travel. And it needs a new zipper. So, just maybe I'll tackle replacing that one. I have a lovely MEC (Mountain Equipment Coop) backpack. One of the older, ones that seemed to have the right amount of room for me. It has a tear in the top zippers material next to the zipper teeth. Okay, I should not have crammed so much in it. It hasn't made it to the top of the pile to replace the zipper. Sigh. I know it will get done ,just a matter of when? I, too, have a backpack zipper to replace!! I've been putting this off for a while. Maybe I will get to it this spring. It's not my backpack, but one of my daughters. She'd like to have this backpack for travel. Good luck with yours! Hopefully this will go much smoother than either you or I are thinking it will! 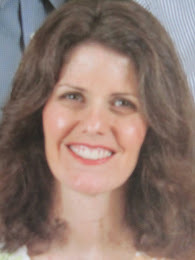 Oh, and thank you, Teresa, for the birthday wishes! When zipper pulls need to be replaced and you still have the hole to attach a pull. I place key fobs( chains) . For some people ( arthritis) or little kids with less fine motor ability the larger fob allows a better grip in the zipping motion. You can also just use the circle part of the key chain if you don't want the other part. Though many times to fob part is easier to grasp in the pulling motion. Thanks for these suggestions, Teresa! These are all very good ideas. I don't mind mending but I hate zippers. It might be a mental thing but I can never get them set properly. I probably would have just had to buy a new jacket. For me, I think it is all in my mind, this dread of doing zippers. As I mentioned, above, I actually hand sewed the zipper into my wedding gown, a very long zipper. It came out beautifully done, because I could take care with each and every stitch. But boy did that take a while. Yes, happy birthday! Thanks to Jo Ann for pointing this out, as I'm not a Facebooker (is that even a word??? ), either. So, this will sound vain, but one of my favorite things about this jacket is that it is slimming, for a fleece jacket! LOL! Yep! That's me, vain as all get out! And for many of my clothing items, that is my biggest criteria -- does it look good? Also, sometimes, something is just a preferred color. I have some favorite pj pants that are a color I like. The pants themselves are rather tattered looking these days, so I keep repairing. But at some point, I will have to find a new favorite pair. I bought a pair of jeans a couple of weeks ago at Penney's for $8--they are Lee jeans which normally sell for $50. After wearing them for a week, I fell in love with them--slimming and comfortable--but my stupendous sale was no longer going on. If I see them again at a great price, I'm snatching them up! Lee jeans from Penneys -- with a coupon and on sale. Were you reading my diary?!! That is the brand I wear, and where I buy them, and yes, on sale, w/ a coupon! I tried on so many brands of jeans, and these made me look better (slimmer) than any other brand. And they're comfortable. I loved them so much that when I found them on sale, and had another coupon, I went back and bought them in black, too. And I've been pleased with how durable they are. I have had the blue pair for about 3 years, and wear them a lot. They're holding up well. And it's nice that they call them "curvy fit" instead of "wide backside jeans". Ha! OK, you probably don't need the extra hip room, but I sure do! I like "curvy". That does sound much more flattering than could have been said. I'm finding out these days I can "waste not, want not" by taking a good hard look at an object before throwing it away. Not only things that are my favorites get looked over twice and rescued from the trash bin. 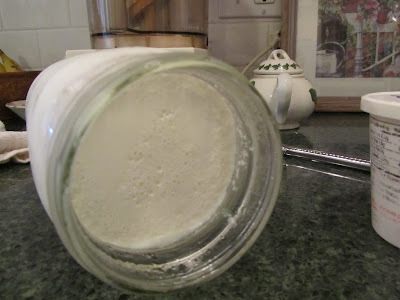 I look at the material that is being discarded...and try to find another use. Also, I try to keep organized so it doesn't look like a hoarding problem. Not only do I save money by not needing to replace, I also feel very satisfied that I have found a way to repair it. Saves not just money but time and effort to find a replacement. Less stress when you are able to repair rather than replace. Soon the store will be last on my list of places to go rather than the first. Thank you for your very helpful solution to plastic zipper problem. I think I came across the coiling but didn't think to reattach it by handstitching. I will keep that in mind next time. And Happy Birthday!! Hope you have a wonderful day!! I hadn't thought about that aspect, but you're right. Shopping for a new fleece jacket, and finding the right fit, etc, would take much more effort and time than I spent on repairing the zipper. In that regard, I am doubly glad to have repaired the zipper. Rather than replacing a zipper, I've put velcro in. This works well in jeans with a big flap. You don't have to disassemble anything with this method. velcro is an excellent idea for anything with one side lapped over the other. I'm thinking of parka-style jackets, with a large flap, especially. Impressive repair! Zippers seem to be my Achilles heel as well. I found some replacement zipper pulls on Amazon once, but alas, I was too cheap to shell out a few bucks for them. My 40 year old winter jacket is about done in the zipper department though - the "insertion pin" has pulled away from the tape. I think replacing the entire zipper is probably the only way to salvage it. Good luck with your jacket's zipper. 40 years old tells me that it must be a good jacket. Many jackets are worthless in half that amount of time. It looks like several of us have zipper replacement on the horizon. I have a similar issue with the zipper on my bag and thought it was it the end of it until I read this post. I wanted to know if you need to put a knot at the end of the stitching to keep it from coming loose again. if you did, does it get tugged on by the zipper? I'm certain I did knot the end of my stitching, and so far, none of the threads or the knot have gotten caught on the zipper. The knot would just be a small one, and as far from the opening/closing part of the zipper coil as I could make it. Good luck with your bag. My jacket has been doing great since my repair, and I wear it about 3 times per week. Thank you so very much for posting this. As you stated, this isn't a fix that's commonly found on any popular how-to sites. I was just about to give up the search when I saw a thumbnail of your zipper on Google images. I thought, oh please let this be more than just a picture. So I clicked, and viola, words! So again, thank you, thank you. I'm using your fix on my backpack. Which will be better than replacing the entire zipper, considering the fact that I did not inherit my mother's 'Seamstress Jeans'. Oh good! I'm so glad to have helped. good luck with your zipper repair. It's always worth a shot at a repair like that. You're only out a little bit of time, in the worse case scenario. Best case scenario, your backpack is back in service, and it didn't cost a penny! Thank you so much for this post! I have run into the same issue with a favorite pair of boots and finding a how-to fix was fruitless until I found this post. I had planned to try something like this, but wanted to check to see if anyone else had tried to repair a problem like this too. Glad that you saved your favorite jacket and helped me save my boots too! I have a favorite piece of luggage I use for ski equipment. There is a two inch section of the zipper where the teeth have separated from the tape. Just like the last person that posted, I was going to try stitching the zipper teeth back onto the tape but wanted to see if anyone had success in doing this. Sounds like I am on the right track. I will post with the results. Thanks. I just wanted to leave a follow-up post after finding your advice online about 1 1/2 years ago. Since repairing the zipper on my backpack, I've had to re-repair it only once about 5 months ago. Other than that, I'm still using the same backpack on a daily basis (back and forth with school and home). So let me just say, once again, thank you kindly for posting this.